Those who deal with operations might have to run about and would not have the ‘luxury’ to be sitting in front of the computer to check on the overall information or statistics. What if… you can now do it on-the-go? Mentorica made it possible! All you need… is your smartphone! A Brief Introduction: Mentorica Technology is creating a new mobile paradigm for managing people, products and information. 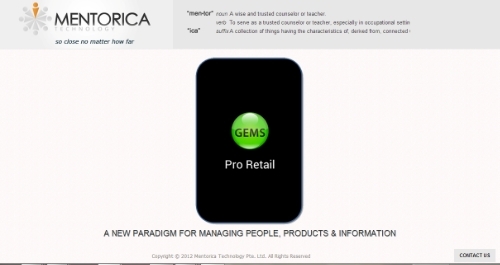 Our “GEMS Pro Retail” system is logically constructed around the needs of the remote retail manager. From the palm of their hand they will be able to both monitor and manage operations via information from real customers, on real products, in real stores, delivered in real time. We had the Founder and a Pioneer Employee from Mentorica to share with us the ‘Behind the Scenes’! Interview Dialogue with Mentorica’s Founder, Mr Joe Duncan and Pioneer Employee, Mr Varun Varma. Initial thought process was to staff along traditional functional lines … technology, marketing and sales, business development, etc. Sourcing candidates went thru the normal channels: contacts, networking, online job postings, school placement offices, alma mater, etc. No magic to it, just a process you have to commit to and then you will discover the most promising sub-channels. For example, your site “StartUpJobs.Asia” has proven superior for online postings. The major challenge I faced is hiring in Singapore. Laws are designed to encourage local hiring, however this is a very tight labour market … look at the unemployment rate under 2%, well below what economists consider “full employment”. We reached a low point early on when trying to hire a high potential foreign candidate. Right after reaching agreement and completing all the paperwork, the rules changed becoming even more restrictive. As a result we lost the hire. Rather than let it cloud my view of what overall is such a great place to live, I ended telling myself that everyone is facing similar challenges (including competitors), and overcoming this is just another opportunity to differentiate Mentorica. Remedies could be adjusting the pay scale up, greater emphasis on local hires, offshore outsourcing, benchmarked bonuses, acquiring some new skills, part-time employees, and consulting arrangements. Now I also make sure to stay current on local labour laws; foreign candidates expect you to be well versed in them, and you will lose some credibility if you’re not. Plans really start changing the moment you begin meeting candidates. Pretty much out of necessity job descriptions are narrowly defined, but you’ll rarely find a desirable candidate who can put a checkmark next to all the requirements. The key is to find good people who can add value, and then design a position around their skills and needs. This flows all the way thru to the papered agreement; typically for compensation experienced sales people want commission-based, developers want fixed pay contracts, and those with entrepreneurial aspirations are looking for broader business development experience and equity. Personally I get a big kick out of seeing how each new addition adds their own stamp or imprint to the original vision; they’re all very important to the ultimate success of the Company. Imprints are evident in our software feature list and user interface, the targeted markets and end users, marketing materials, and the pricing strategy. Flexibility, flexibility, flexibility … cannot emphasize that enough. Engage people in a way that suits them, and that you can live with. At times this can put you at odds with investors who may want a certain type of familiar arrangement. Faced with this choice I made the decision to do what’s right for the business. At some point a growing list of satisfied customers and profitability will speak loudest. Also, realize that your initial hires are your most important recruiting ambassadors. If they perform, I try my best to exceed their expectations of what they were looking for out of the position. You want this reputation, and anyone you would want to hire is smart enough to know if previous hires are sincere in their praise of you as an employer. And next we move on to the Pioneer Employee of Mentorica, Mr Varun Varma. 1) What made you join a Startup in full-time employment? Having worked in a large multinational financial institution before, I wanted the chance to try out a new and different work environment. Also, at some point in the future, I want to consider starting my own businesses, so it made sense for me to try working for a startup. One of the biggest challenges in the early stage is deciding which ‘problem’ exactly we want to solve. While we are working on a new product, we want to try to make sure there is ultimately a market for the product we are creating. We spent time discussing the basic functions and target segment of our product, and this is probably the most important challenge in the early stages – creating a useful product. One the biggest advantages (and disadvantages) of business development is that there is no clear ‘limit’ to what one is expected to do. I joined with the expectation that I would get to work on varied and numerous challenges, which I certainly did. I got to work on product development, product testing, marketing, business strategy and content management. 4) Challenges are inevitable in a startup environment. Prior to join Mentorica, are you ready for these challenges? Or did you know what you might have to face? Working in a startup is quite different from working in a large company. It did take some getting used to, but it was not that hard of a transition. 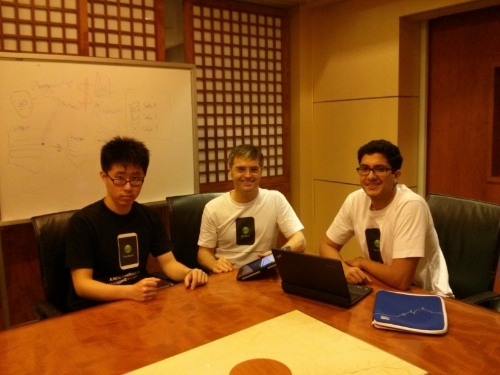 I also had a good discussion with the founder prior to joining, so I was quite clear about my deliverables. Ultimately, regardless of the work environment, one still needs to set goals, and work towards achieving them. All in all, it was a great experience!